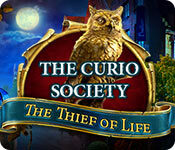 An old ally has betrayed the Curio Society, so you've been called in to help! It's up to you to stop a mad scientist from destroying the organization, but it wont be as simple as it seems. It's a battle of wits as you try to save both of your friends and the world! Can you stop the culprit before it's too late? Find out in this electrifying hidden-object puzzle adventure!